Bags: A bag (also known regionally as a sack) is a common tool in the form of a non-rigid container. The use of bags predates recorded history, with the earliest bags being no more than lengths of animal skin or woven plant fibers, folded up at the edges and secured in that shape with strings of the same material. 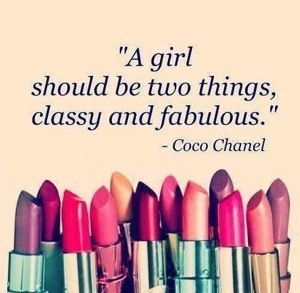 Oh what a brilliant quote, and there couldn’t be a better way to start this review than with this quote as Mia Tui bags are without doubt both classy and fabulous! I first discovered Mia Tui, through Twitter, last year in November. I was becoming increasingly frustrated with the baby changing bag I had (I won’t tell you the name, but it wasn’t cheap) as I could never find anything and it didn’t open wide enough for me to even have a proper look. It drove me nuts that every time I needed something, I had to empty the entire bag out onto the floor (not great when you’ve a young baby with you) and don’t get me started on the amount of times I lost my keys in the depths of it. 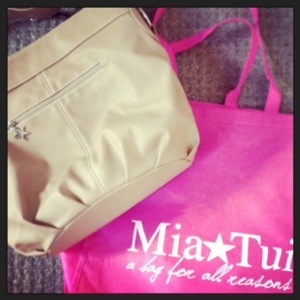 So, when I saw Mia Tui advertising their bags I instantly wanted one. Their unique and award winning interiors make it impossible to lose anything! There is a place for everything, and their range of stylish bags will suit everyone for every occasion. 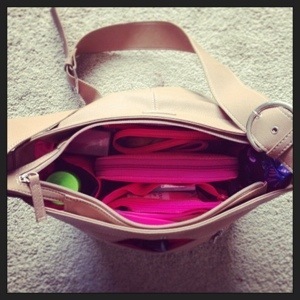 Baby changing bag, work bag, gym bag…their uses are endless. I quickly persuaded my husband to purchase the Minnie Amelie in steel blue (gorgeous colour) as my Christmas present. A smaller version of their signature Amelie bag, this bag can be can be used as a changing bag, travel or work bag. Waterproof inside and out with multiple pockets, clips and extra clear bags (great when travelling) meant it was perfect as changing bag for me and I never lost my keys again! I then visited The Baby Show and met the lovely Charlotte, who is the genius behind Mia Tui, in person. She was lovely and so helpful and there was such an amazing offer on that I ended up going home with two more Mia Tui bags…an Amelie which is now used as our family swimming bag, and a Sofia which is my work bag with enough space for notebooks, my iPad, pens, lunch and so much more! Now…you’d think I’d be happy with my Mia Tui stash of bags wouldn’t you?! But no…ever since I first discovered them I had had my eye on the Grace. I loved the fact that it had the option of it being a cross-body satchel or a more traditional under the arm handbag. And with my youngest being a toddler I didn’t need to carry quite so much stuff out and about with me on a daily basis so was looking for a smaller bag. So I tweeted Charlotte and asked if she’d like me to review one…the next day the bag arrived and it is amazing! The sand colour is so stylish and people ask me all of the time where I got my bag from…many of my friends have gone home to purchase their own after seeing mine! The interior is spacious and the layout makes everything so easy to find. The clear bags are big enough for me to put in a few nappies and a packet of wipes and the bag has plenty of space for spare toddler clothes and snacks. My Mia Tui purse (yes I have one of those too!) fits in perfectly and the small clutch bag that comes with it is perfect for my, erm lady things. I love bags that have zip closures so everything can’t fall out and so this fitted the bill there too. It has the elastic clip for my keys so I can reach in with my toddler-free arm and find them in no time. Quite simply I love it, it really is functional and stylish…and fabulous! 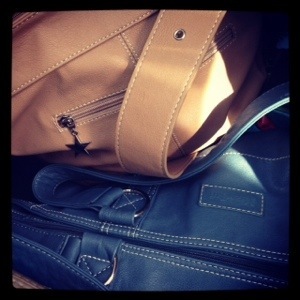 So now wherever I go I take a Mia Tui bag with me…and more often than not, more than one!